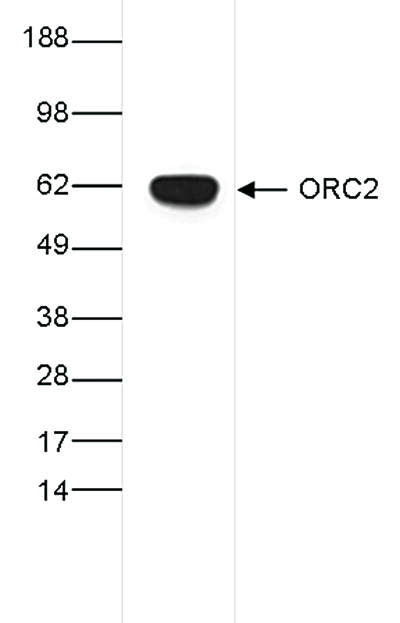 Request a quote for a bulk order for ORC2 monoclonal antibody - Classic. Please fill out the form here below. Your local sales account manager will get in touch with you shortly and send you a quotation based on your requirements. Monoclonal antibody raised in mouse against human ORC2 (origin recognition complex, subunit 2), using two recombinant proteins containing the N-terminal and C-terminal part of the protein, respectively. RIPA cell lysates from HeLa cells (30 μg) were analysed by Western blot using the Diagenode monoclonal antibody against ORC2 (Cat. No. C15200198) diluted 1:500 in PBS-Tween containing 10% milk. The position of the protein of interest is indicated on the right (expected size: 66 kDa); the marker (in kDa) is shown on the left. Diagenode strongly recommends using this:	ORC2 monoclonal antibody - Classic (Diagenode Cat# C15200198 Lot# 001). Click here to copy to clipboard.